Have you ever dreamed of taking a vacation trip to France to ride your bike? Have you watched the Tour de France from your home and yearned to be there, riding and cheering? Your dreams are possible - experienced bicycle tour companies are ready, whenever your are, to turn your dreams into reality. But the tour operator you select matters, as a fan who has traveled to France and the Tour de France for many years, I appreciate the hard work that goes into providing excellent experiences for cycling fans, I also recognize quality. 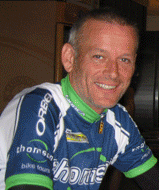 I was happy to have a Skype conversation with Peter Thomson of Thomson Bike Tours (www.thomsonbiketours.com) last January. I specifically wanted to interview Peter because of his company's deep and broad experience. They operate bike tours in Spain, France, Italy, Switzerland, and Belgium, guiding trips for fans to the Tour de France, Giro d'Italia, Vuelta a España, Criterium du Dauphine, and the Paris-Roubaix as an official partner with A.S.O. (Amaury Sport Organization), organizers of the Tour de France. Thomson bike Tours is one of only two operators worldwide to hold a "Master" License as official tour operator for Paris-Roubaix Gran Fondo and all other ASO cycling events. As a partner Thomson Bike Tours is eligible to lead bike tours and offer VIP access to any A.S.O race. In 2012, they will be registering riders for both acts of the 2012 L'Étape du Tour, held in July, as an official tour operator. Thomson Bike Tours is also known for their popular non-race chasing trans trips offering avid cyclists the opportunity to cycle across a choice of mountain ranges in Europe. 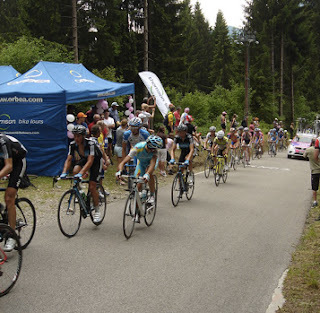 In addition they run cycling tours to the Alpes, Tuscany, or Lombardy and Lake Como. Looking for a challenge - ride across a mountain range in 1 week. 2012 trip schedule. I know enough about cycling in France to recognize a very well planned itinerary. I believe Thomson Bike Tours does it right and is contributing to making the fan experience a good one. 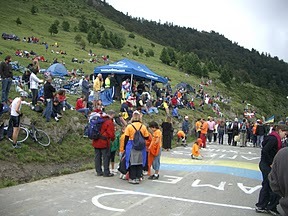 In 2008 I rode to the top of Col d'Aspin on a stage of the Tour de France, and there I witnessed the happy Thomson Bike Tour clients gathered under this tent at the summit of the col. Believe me, I wanted to join them. I never imagined when I clicked this photo below that I would be meeting Peter by Skype years later. 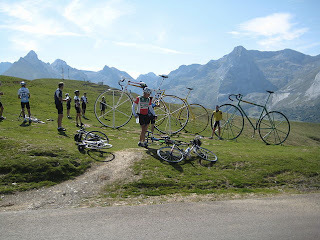 Thomson Bike Tours created one of my all-time favorite lists - a list of the top 50 climbs in Europe. A purely fun list which instantly creates a bucket list for every cyclist who dreams of cycling in France and Italy. Request your copy of their recommended top 50 climbs by writing to Thomson Bike Tours at: Send me my new to-do list. What are the benefits of joining a tour company? Experience; a professional tour company will save you 100's of hours in planning a trip on your own. They remove the guess work, the probable blunders, the communication gaps, the need to check your GPS every 12 miles, the need to rent a car, arrange accommodations, or pack all your water and food on your back during an already hard-enough climb up a mountain side. Tour companies are a smart luxury. By the looks of their profile maps they also count the Cols for you, and maybe encourage you to keep climbing! Thomson Bike Tours Trans-Alps route, do this in 7 days! Now that we have covered who, where and why, it is time to hear from Peter. Knowing that the readers of Pedal Dancer are a group of fun-loving professional cycling fans who like to ride a bike and enjoy the culture of other countries, I contacted Peter Thomson with some simple questions. I finished the conversation wishing I could spend a week cycling with Pete, his enthusiasm and knowledge were evident but relaxed. In 2002, after moving to Barcelona with his wife, Peter headed to the Tour de France organizing a trip for 4-5 friends to watch the race in the Pyrenees. Two or three days into their own trip, one of those friends suggested to Peter that he "do this for a living." That very night they happened upon a Graham Baxter tour group at their hotel in town. After listening to the comments (and yes complaints on logistics) from some of the 60-80 guests, it occurred to Peter that he could do it better. He returned to Barcelona where he currently lives, had a friend put together a website, organized his trip to the 2003 Tour de France, within one month he had bookings. "Ok Paul what do we do now," he laughed remembering his comment to his friend. The next year he lead a dozen clients on his first tour to the Pyrenees and the Alps. "It all just took off from there, pure chance, I had never thought about it before," Peter said. They had a great time, the clients returned home and told their friends, the next year they had 60 clients. Peter had been working in IT at the time, he was a project manager at SAP. He marveled how that one comment at the 2002 Tour de France had changed his life (and many others). 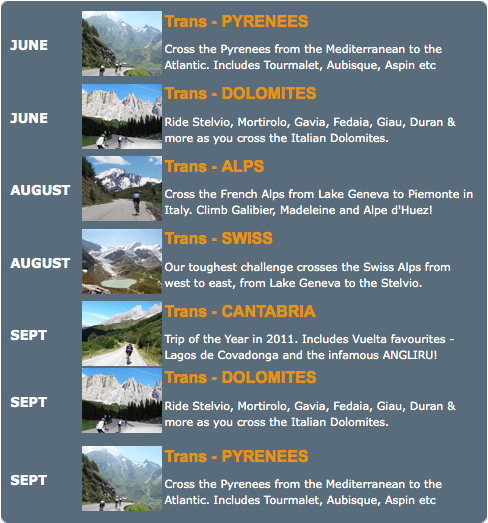 The last 4 years have been particularly busy for Thomson Bike Tours. Karen: Not everyone is suited to lead a tour or build a company as you have, to complete the logistical work so that others may enjoy themselves. What made you think this was a good fit for you? Peter: I have always loved cycling, I have always loved the mountains. I grew up in Scotland, we would ride our bikes to get to the mountains so that we could climb every weekend. And I have always loved maps. I could sit and look at a map for hours. I could ride my bike, I could share all these great bike rides with people, and I could use the maps. All the skill set I learned in project management - I could use in organizing bike tours. I had my resource and gantt charts (he laughs) - it all worked. All the planning that went into the trip, everything just worked and the client really appreciated that, they loved being able to relax and enjoy themselves. I get emails from people that say it has changed their life forever, just phenomenal emails. We have clients who come twice a year. They say, "I don't have to pay for a therapist, I just come to Thomson Bike Tours." I have built up so many friendships over the years. I view most of the clients as friends. Karen: Do you have a large percentage of repeat customers? Peter: About 85% of clients each year are either repeats or word or mouth. It is a huge network, we don't have to do much advertising. If you put on a good trip and everyone has a great time, they will go back on their Sunday morning ride and tell everyone about it. If you put on a bad trip, the same will happen, so you just have to continue to put on great trips and the clients will do the work for you. They absolutely want to come back. People come every year, or two years, on some trips we have 20-30 repeats on the one trip. It becomes a club atmosphere, the old clients take care of the new clients. Karen: I saw your group at the top of the Col d'Aspin in 2008, I saw your tent and I have to say your clients were having a great time. On over five trips to the Tour de France I have seen most tour companies out there, some are over the top, some are huge, sometimes the people are clearly not happy; I wanted to speak with you because you appear to do it right. Peter:: We have a lot of fun, the staff are all personalities in their own way. It is what I want to have; we ride hard, each tour is very very challenging, but at the end of the day we want to have a good time, we want to have a good laugh. It is that mix of having really good rides, behind it all you have to have good support, the clients are willing to get out and try to ride 4 cols in one day because they know the support is there. The support has got to be there, then have a nice time at night. That night before the stage of the Col d'Aspin, there was a huge thunderstorm at 1:00am, all the tents blew off the top across the road and down the mountain side, it was wild, but it all came off pretty well the next day. Karen: Do you have a guide that stays overnight in your locations? Peter: Yes, to get that place on the Col d'Aspin we have students that work with us, they will go up and camp out 2-3 or 8-10 nights before the stage comes through. They camp out and hold the spot, then set up the day before. It is the only way to get a good spot. On Mont Ventoux we had a team in place 10 days before. People will say to us, "oh your trip is kind of expensive" but once they have been on the trip and see all that goes into it, they say "wow". Because a lot of tour companies abandon their clients on the mountain tops, one year on the Peyresourde, we had the entire Steve Bauer Tour inside our tent watching the TV. Karen: I have always enjoyed the list you put together of the top climbs in Europe. Which is your favorite? Peter: Your favorite is often the climb you rode well on the year before, but I would say one of my favorites in the Stelvio, or the Col d' Bonnette, it is a beautiful climb from the northern side. Karen: What about your clients? Peter: The ones they want to do before they come over are Alpe d'Huez, Galibier, and the Stelvio. After they have been over the most popular climb is probably the Stelvio. Have you done the Stelvio? Peter: Oh, from the Plateau de Stelvio, is beautiful. Karen: Last year A.S.O. began offering two stages in L'Etape du Tour, are you guiding both and why did they decide to offer two stages for cyclotourists? Peter: Yes, and demand. There is a massive demand in Europe, they sell out. From an organization and logistics standpoint it is big, I will be going to both of them this year. Our tours will be limited to 20-30 people for each stage, I want to maintain a level of quality and control. Karen: Which tours have already sold out this year (this interview was in January)? 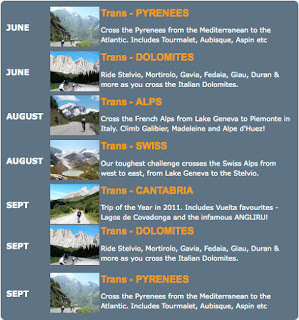 Peter: Trans-Dolomites is completely sold out. 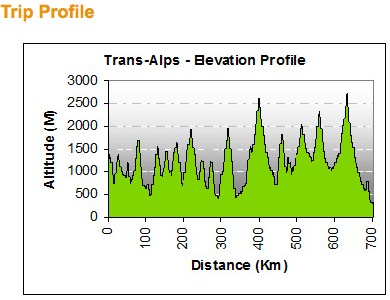 Trans-Pyrenees, Trans-Alps, and our Trans-Swiss. We have a series of trans trips and they are doing really really well. It is the level of difficulty, and the aspect of crossing a mountain range that appeals to people, it captures their imagination. Karen: That kind of imagination is especially nice when sitting at an office desk throughout the winter months. Peter: If you look at our typical client they are definitely Type A personalities, they love the challenge, they love it to be hard, they have been successful in their business life and now they want to do something else. Karen: Have you ever been blocked off at the bottom of the Tourmalet on a day of the Tour de France? Peter: Oh ya, many times, for various reasons sometimes they change the [closure] time. It happened on Mont Ventoux. I was waiting for the last few clients to come through, I have a checklist of clients, as I waited they [the Gendarmes] closed the road. I always have a plan B, I had scoped out another route through a vineyard, so we ran through the vineyard and hopped back on our bikes. There is always a way around, you just have to know the area, and keep going at it. Karen: Where do your clients come from? Peter: 80% from North America, Australia, South Africa, Mexico, Hong Kong. If Europeans want to go to the Tour de France, they jump in their car. There has to be an overseas clientele [Peter speaks English, Spanish, French]. By 2013 there is a good chance we might begin offering tours in North America. Karen: I am not certain people understand the level of quality you offer on your tours. Karen: Some of the cycling tour companies are huge, I don't know how they don't loose people. Peter: Oh we have found people. 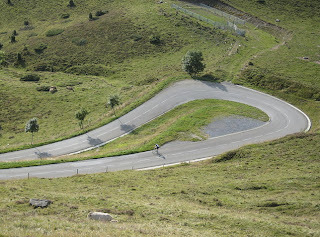 I think the first one was two guys we found in the Pyrenees at the top of a Col de Peyresourde. It was between 7 and 8 at night, they were completely lost, they hadn't seen their tour group in the past 2 days! They had stopped and found their own hotels. They had a .pdf with the tour hotel names, we took them to the bottom of the valley [2 valleys away], and set them on the bike trail to Lourdes. They were two climbs away, they were cold, lost and starving, so we took them in the van. That is terrible. There was another tour operator team of a husband and wife at the Giro who had 3 clients and managed to loose all three. The husband was standing outside the hotel with a pair of binoculars at 8pm looking for them. There are lot of good tour operators, but some are an embarrassment. 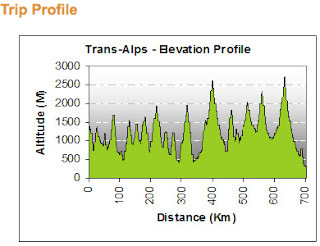 Karen: Do most of your clients want to go to a mountain top finish, time trial, start or finish of a stage? Peter: The mountain top. They might want to go to a stage finish, just to hang around the technical area and meet some of the riders. But the main focus is the mountain top, because we have the tents and the satellite TVs, and the big buffet lunch, and such a nice atmosphere - they really enjoy that. Karen: I am smiling because for me, when on my own, a mountain top finish means I will be out there for hours, hungry, thirsty, cold, absolutely wiped out the next day. I need a full rest day after a day at a mountain top. No wonder your clients like the experience if you make it so nice for them. Peter: It is a bit of a fear factor for me, I am going to take 30 guys to the top of the Tourmalet, it can snow in July at the top, I can't leave them at the top without shelter. It can be miserable up there. Karen: If your clients are well taken care of, it means they can enjoy every day of their vacation. Peter: If you have ridden up Tourmalet, and you have sat up there freezing all day, and you need to ride up over the Peyresourde to get back to your hotel ... what a miserable day. I think of myself, what would I like to do? Every client has a backpack we bring up for them so they can change out of their wet clothes and have a nice time up there, it is a different philosophy. Karen: I want to sign up. Peter: For us it is a logistical nightmare, but there are ways of getting the supplies to the top. Karen: Do your clients come with proper gearing? Peter: No. I recommend they come with a triple or at best if they are a strong rider come with a compact 34-27/28. Take my recommendation. But every year someone comes with a 39-25, by the second day they are cooked. People don't understand if you ride these climbs one-off you can get up, but if you ride 4 cols in a day, and then the next day and the next day, then your legs start to hurt, so you need the small gears to get through the entire week. I could be a millionaire if we had a stock of triples and where selling them halfway up the Tourmalet. It doesn't help that it looks relatively easy on the TV coverage [by the professionals]. Karen: Every year when the route is announced, is there an area where you are excited to see included and pleased to go back to? Peter: Probably around La Clusaz near the Col d'Arvis/Col d'Croiz Fer (Grand Bornand area east of Lake Annecy). It is a beautiful area [this happens to be my favorite as well]. Other than that I am always happy when there is something around St-Lary-Soulon, Col d'Azet/Val Louron, Col de Peyresourde [all in the Pyrenees]. There are some areas where you know the hotels are hard to find or there will be van transfers, we avoid van transfers at all costs, clients come to ride their bikes. Karen: What is your favorite region of France? As much of a logistical wizard that Peter Thomson is, he is also a good rider and an excellent story teller. He has been to the Tour de France for 30 years, guided for 10 years, if you enjoy stories of race history, travel, and key riders through the years - Peter Thomson is a treasure trove of stories. I will save these stories so you may hear them first hand during your trip. You will be assured of hard rides during the day and entertaining stories over dinner in the evenings. During our 1'20" interview I enjoyed Peter's stories of Bernard Hinault (an old teammate of his), Alberto Contador, Lance Armstrong, George Hincapie, Poppo, and others. This morning Thomson Bike Tours published an interview with two of their recent clients in their newsletter. Sign up today and you can read Fred Schwartz from Larkspur, California and Gary Mann of Seattle, Washington tell their stories. 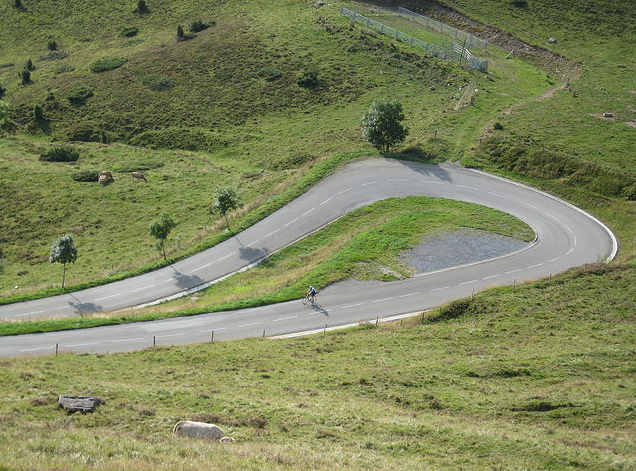 I wrote a previous post about Thomson Bike Tours and their top 50 climbs list included in the Grand Tours of 2011: The best climbs in Europe in the Grand Tours, or A non-cycling fan trip to the TDF (also offered by Thomson Bike Tours). An earlier post about cycling tour companies Take a Tour. I have included sections of this interview with Peter in other posts in recent months: George Hincapie, Contador and Armstrong. View the 2012 Thomson Bike Tour trips, view their trip photo albums. 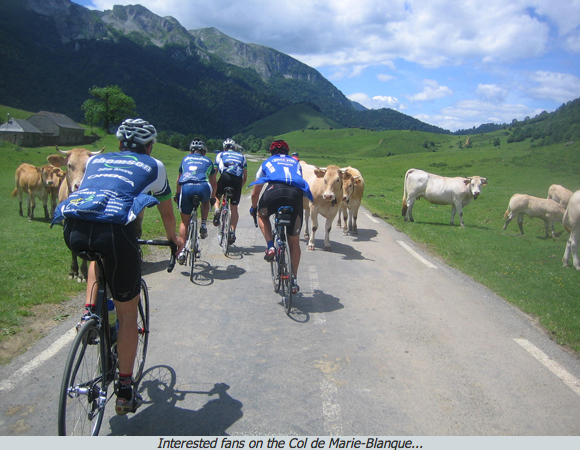 Sign-up for Thomson Bike Tours' regularly published newsletter with stories and wonderful photography. Watch a video of their clients at the 2011 Tour de France (with loud music).